In this generation, social netwo rking has become an important communication tool for people to interact with each other. But, has social networking affected our ability to communicate with our colleagues in the scientific field? I definitely believe so. How can I be sure of that? Just remember your last visit to a scientific conference, symposium, or meeting. In the agenda, you probably found a scheduled time to “network” with others and to discuss the latest research. The “poster session” is possibly one of the most commonly known scheduled “networking” sessions in scientific meetings and one of the best opportunities to make your contribution known to the scientific community. Communication among experts and scientists is not a new concept, but I am convinced that the way we communicate our ideas is changing. “Scientific networking” (as I call it) is becoming redefined. How can I be sure of that? The existence of blogs, forums and listservers dedicated to encouraging the sharing of ideas, projects, and knowledge among the scientific community are serving as the “networks” that allow us to find out what’s going on in countries oceans away from us. 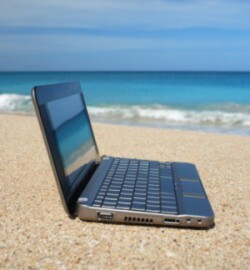 With this is mind, I’ve listed some blogs, forums and listservers that are presently aimed at communicating about marine and coastal issues. I also included a list of blogs from UPR Sea Grant, which has also dedicated efforts to communicating their activities with the local public. Other noteworthy websites are also listed for more interesting news concerning topics on marine and coastal issues. 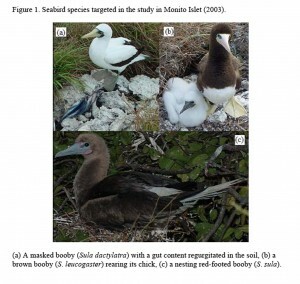 Ricardo López-Ortiz, from the Puerto Rico Department of Natural and Environmental Resources, studied the foraging and feeding habits of seabirds of the genus Sula in the Monito Islet of the Mona Channel near the island of Puerto Rico (López-Ortiz, 2009). The study (supported by UPR Sea Grant) is perhaps one of the few descriptions of the foraging habits of boobies (Figure 1; p. 115) that suggests that the feeding habits of seabirds could also serve as a mechanism for monitoring the population of epipelagic species at their juvenile and post-larval stages. Seabirds could provide (through regurgitation) samples of epipelagic fishes that could, otherwise, be difficult to obtain. In the large scheme of things, seabirds compete with fishers, fishes, and other marine species for a number of their target preys, and thus must be factored into the management equation as Cury et al. (2011) suggests. Cury PM, Boyd IL, Bonhommeau S, Anker-Nilssen T, Crawford RJM, Furness RW, Mills JA, Murphy EJ, Österblom H, Paleczny M, Piatt JF, Roux J, Shannon L, and Sydeman WJ. Global Seabird Response to Forage Fish Depletion—One-Third for the Birds. Science, 23 Dec 2011: 334 (6063), 1703-1706. Caribbean Marine Biodiversity: Has much changed over the past few years? Patricia Miloslavich and Eduardo Klein in their 2005 publication titled the Caribbean Marine Biodiversity: The known and the unknown present a general description of the major marine ecosystems and species found (referred to as the “knowns”) in the Caribbean region, an area that comprises about 2,754,000 km2 and is considered among the top five of the world “hotspots” for marine and terrestrial biodiversity. The authors also identified the “unknowns”, drawing attention to studies that must be addressed in each country to better understand the present and future status of Caribbean marine biodiversity in order to establish better resources management practices. 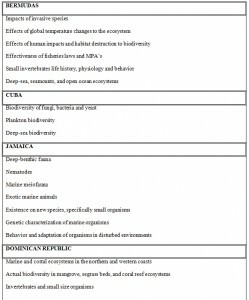 Overall, areas that required more studies included the taxonomy of small-sized organisms, cryptic and rare species (Table 1). Surprisingly, there were few studies regarding the biodiversity of planktonic species. Phyto- and zooplankton organisms represented the first and second trophic levels of the marine food chain, respectively. Phytoplankton species are one of the main primary producers in the marine environment and, thus, are responsible for the uptake of carbon from the atmosphere and its transfer to other levels. It is widely known that phytoplankton composition can be used as an indicator of environmental health (i.e., ecological indicators) and, therefore, can be used as a tool for management. On the other hand, commercial and ecologically important species, such as fishes, lobsters, and sea urchins, spend most of their larval stage in the form of meroplankton. With this is in mind, they should be considered essential for studies on organisms associated with zooplankton diversity. They also represent the link between primary producers (i.e., phytoplankton) and higher trophic levels. Marine microbes (e.g., bacteria, fungi, and yeasts) were another group of “unknowns” that required more studies. Bacterioplankton represented an important “sink” of carbon in the ocean, accounting for about half of the carbon fixation in the marine environment. In addition, they may serve as an index of water contamination, which may contribute to establishing effective management practices. In general, a need for trained personnel, equipment, law enforcements, more research and education among the community was identified in order to establish better management policies to protect the marine environment in the Caribbean. In addition, more efforts that integrate research and collaboration among different areas of the region were highly recommended. For more details on the studies needed by countries that were assessed in this publication (Bermuda, Cuba, Jamaica, Dominican Republic, Puerto Rico, Venezuela, Colombia, Costa Rica, and Mexico), click below on Tables 2-4. 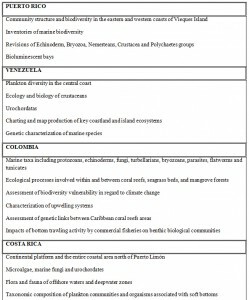 In a more recent publication (2010) by Miloslavich and a team of 16 other experts, the regional estimates and distribution patterns of the Caribbean marine biodiversity are re-evaluated based on major activities conducted by the Census of Marine Life Program (click here for access to the full text version of this article through our publication database). Over 12,000 marine species were reported in different sampling areas that mostly included shallow, nearshore waters of the region. Limited amounts of data were available from offshore and deep-sea environments since they have been less studied. Interestingly, Miloslavich et al (2010) identified four factors that made their assessment on the “true” distribution patterns of marine biodiversity practically unattainable and that particularly included “high variability among collecting methods” (Miloslavich: e11916). This statement coincides with comments made by several experts who have participated in our discussion sessions, emphasizing the need for standardized methods of collecting data necessary for establishing species inventory and baselines. Although many marine species have been identified, being able to obtain a sufficient amount of data collection to accurately represent and describe the marine biodiversity of the region remains as a major concern. Addressing this concern may help to resolve other pertinent issues that may be directly affected by this particular need (for example, establishing baselines of commercially-important and recreational marine organisms). It is imperative that managers, scientists, and conservationists draw the attention of important local stakeholders and agencies in making extra efforts, as a region, to address these concerns and bring about the change needed for the past few years. Table 1. 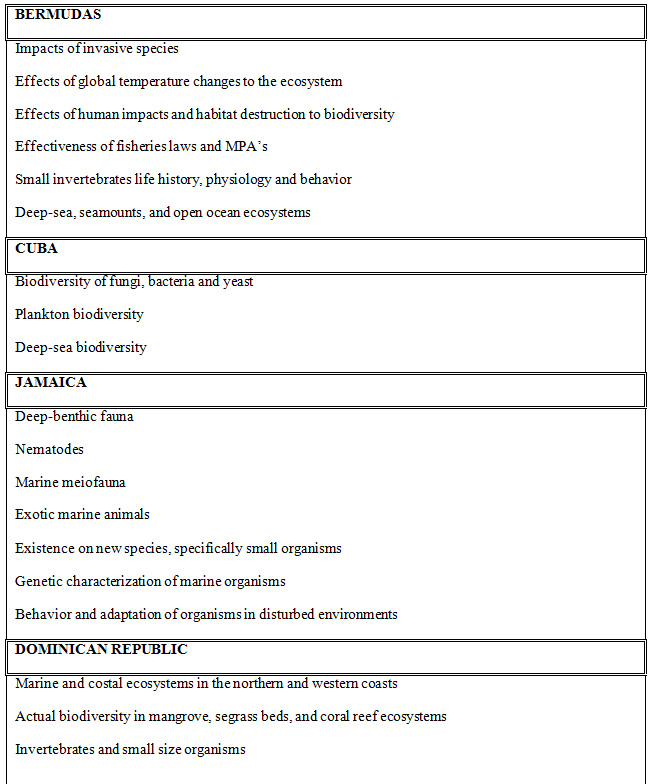 General overview of the “unknowns” of marine biodiversity throughout the Caribbean region (Miloslavich and Klein 2005). Tables 2-4. 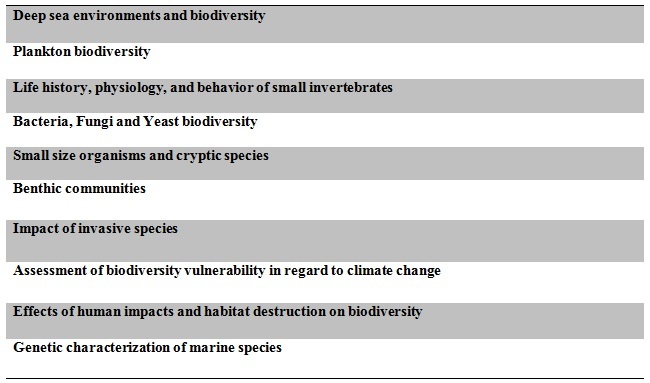 Detailed overview of marine studies needed by country (Miloslavich and Klein 2005). Miloslavich P. and E. Klein. 2005. 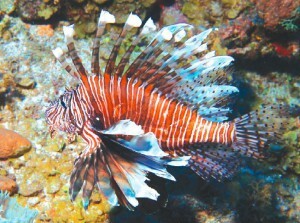 Caribbean Marine Biodiversity: The known and the unknown. DEStech Publications, Inc. Pennsylvania. 310 pp. Miloslavich, P., J. M. Díaz, E. Klein, J. J. Alvarado, C. Díaz, J. Gobin, E. Escobar-Briones, J. J. Cruz-Motta, E. Weil, J. Cortés, A. C. Bastidas, R. Robertson, F. Zapata, A. Martín, J. Castillo, A. Kazandjian, and M. Ortiz. (2010). 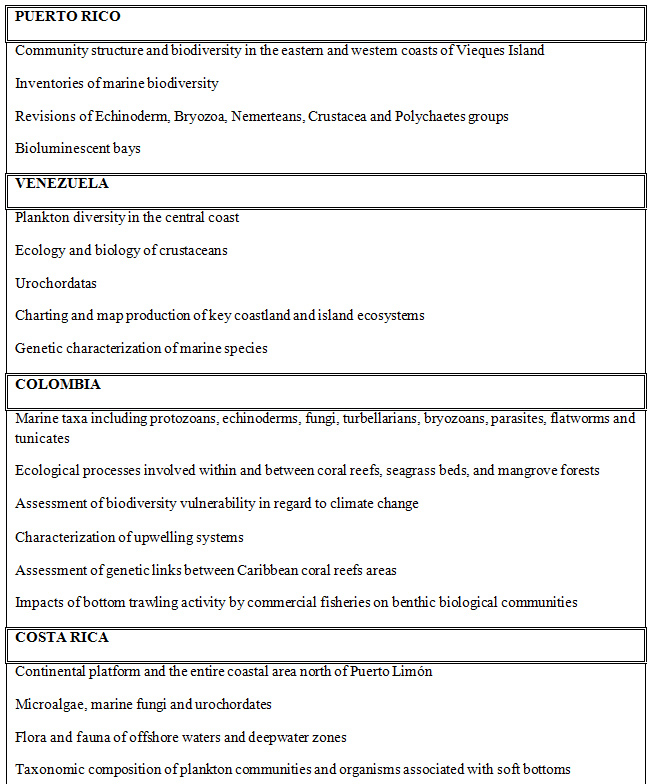 Marine biodiversity in the Caribbean: regional estimates and distribution patterns. Public Library of Science (PLoS) 5.8 : e11916. CariCOOS (http://www.caricoos.org/drupal) is the observing arm of the Caribbean Regional Association for Integrated Coastal Ocean Observing (CaRA; http://cara.uprm.edu/). This effort, funded by the NOAA IOOS office, is one of eleven coastal observing systems and regional associations, which along with federal agencies constitute the national coastal component of the US Integrated Ocean Observing System. In the implementation of the Integrated Coastal Ocean Observation System Act (ICOOS Act), NOAA, the lead Federal Agency, requires that CariCOOS complete a “10 year build out plan”. 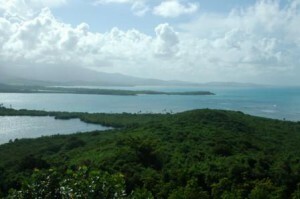 To date, CariCOOS has focused largely on providing coastal climate information. The requirement for a 10-year term plan gives us the opportunity to meet other needs aligned to the objectives of promoting commerce, improving security and ensuring sustainable use of coastal resources. In order to identify further needs for data and products, CariCOOS has designed a BUILD-OUT SURVEY for stakeholders, experts and local community members. To complete this survey in English, please click here. El Sistema Regional de Observación Oceánica Costera del Caribe, CariCOOS (http://www.caricoos.org/drupal) por sus siglas en inglés, es uno de los once sistemas regionales de observación oceánica costera que constituyen el Sistema Integrado de Observación Oceánica estadounidense, IOOS. El sistema IOOS proporciona datos y productos para satisfacer las necesidades de las partes interesadas en la región. En la implementación de la Ley del Sistema Integrado de Observación Oceánica Costera (ICOOS Act), promulgada el año pasado por el Presidente Obama, la NOAA, Agencia Federal líder, requiere que CariCOOS diseñeun plan de desarrollo (“buildout plan”) a 10 años plazo. Hasta el presente, CariCOOS se ha enfocado mayormente en proporcionar información de clima costero. El requerimiento de un plan a 10 años plazo nos brinda la oportunidad de atender otras necesidades alineadas a los objetivos de promover el comercio, mejorar la seguridad, y garantizar el uso sostenible de los recursos costeros. La siguiente encuesta está dirigida a la identificación de necesidades eventuales a mediano y largo plazo (horizonte de 10 años) de datos y productos para continuar la construcción del sistema CariCOOS. Para completar la encuesta en español, por favor oprima aquí. The Caribbean Large Marine Ecosystem Publication Database consists of reliable sources of information found in peer-reviewed scientific journals, books, websites, thesis/dissertations, and government documentation associated with marine/coastal management and conservation in the Caribbean region from 1998 to the present. Over 50% of the resources found in the database are freely available online. However, it is NOT a comprehensive database of all of the marine studies performed in the Caribbean. The purpose of this database is to serve as a reliable portal of information for studies that focus on managing and conserving our natural marine and coastal resources in the Caribbean, including international countries. Please do not use terms such as “marine” and “Caribbean” for your keywords. The publication database is dedicated to marine and coastal studies in the Caribbean. Therefore, unless these words actually appear in the title or abstract of your article or resource, using them in your search will greatly reduce your final results. For example, if you search for “Mangroves Caribbean”, you’ll get 18 resources. But if you eliminate “Caribbean” and search for “Mangroves”, you’ll get 36 resources! That’s twice the number of resources! We recommend that you use English terms. Although several of our resources may have some Spanish translations or versions, most of the resources listed are in English. Search by the author’s last name. Some references are easily found by the name of the author(s) of the report or article you are searching for. Search by using ONE keyword or “root” word that summarizes the main topic or subject of your inquiry. For example, when searching for a certain type of coral species and you have trouble finding it, try searching using “coral” for a broader range of results. If you’re using a keyword that is very specific, you may be limiting the number of resources that may be associated with your main topic. Use Advanced Search to narrow down search hits and customize your search based on your interests. With this option, you can select from a list of options (e.g., keywords, resource type, creator, etc.) along with your keyword. Use our “Select” option from our Resource Menu if you’re still having limited results. This search option gives you a list (from different types of fields) of all of our resources to choose from. If all else fails, send us an e-mail with the information that you’re searching for and we’ll try to help. Our quick tutorial on how to use the publication database can also be very helpful. You can access this tutorial at any time from the CLME database Homepage. The Department of Commerce and the National Oceanic and Atmospheric Administration (NOAA) recently released new national policies aimed towards sustainable marine aquaculture practices to cope with the increasing demand for seafood production, to promote job creation associated with coastal communities, and to restore critical ecosystems (Read the full news article here.) Among the priorities set for developing sustainable practices, the administration hopes to initiate a partnership with the shellfish industry to increase production and improve water quality. Interestingly, one of the comments that was frequently mentioned in our discussion session on sustainable mariculture practices in the Caribbean was to identify and prioritize the cultivation of important “filter feeders” (molluscan species such as conch, oysters, clams, etc.) since they can help improve water quality and clean coastal waters, making for environmentally-friendly shellfish mariculture. However, a comprehensive aquaculture strategic plan was deemed necessary for its implementation along with the development of indices and standards that could help define what parameters are needed for sustainable, environmentally-friendly practices in Caribbean coastal waters. 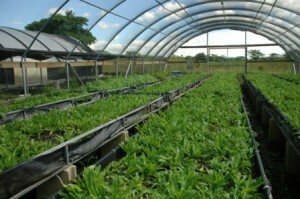 In 2009, international efforts to engage governments for the development of a regional shellfish hatchery in the Caribbean was made by the Aquaculture Service (FIRA), Department of Fisheries and Aquaculture of the Food and Agriculture Organization of the United Nations (FAO) (click here to read their report). Of the 21 countries assessed, 14 demonstrated interests in studying the cultivation of native molluscan species. The historical perspective on mangroves is becoming extremely important for understanding the so-called “natural history” of coastal ecosystems. The Martunnizi et al (2008) paper I discussed in the previous entry in this blog (click here to read about it) is an example of such a perspective. Dahdouh-Guebas and Koedam (2008) published an interesting article on the need for a “transdisciplinary” approach to understand the natural and anthropogenic dynamics of mangroves. Social and economic histories shape the contours and size of mangrove forests throughout the world (and all ecosystems, I might add), and following that line of thought, the authors make a strong case for the incorporation of a multi-tiered and transversal study of mangroves. That is, a research agenda that incorporates a number of fields in the human and life sciences that traverses boundaries among disciplines and charts the trends (both physical and social) of mangroves throughout time. Different disciplines offer a variety of opportunities to increase our knowledge of mangroves at different temporal scales: the present and the recent past (forestry, ecology, remote sensing, landscape photography, interviews with the local population), the past (archival information, historical sources, archaeology, paleoethnobiological data) and the distant past (lichenometry, paleontology), as well as other techniques that provide information on a wide spectrum of temporalities (substrate cores, isotope analyses, genetics, etc.). The authors argue that scientists should go beyond the interdisciplinary approach (pairing two or three research techniques to calibrate the information or to solve a problem), and rather use a transdisciplinary approach. Many readers will find those definitions troublesome, but the authors make a great case for the use and sharing of information from an array of disciplines, expertise and techniques to understand the mangrove ecosystem, taking into account human history. Indeed, they go as far as to argue that the knowledge of the mangrove’s spiritual heritage is invaluable to the analysis. In the Caribbean, the mangrove is a place of important cultural and spiritual meanings, as this ecosystem is associated with maroon societies, deities and religious practices of African descent and heritage. 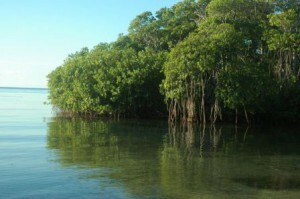 The mangrove is also a living metaphor of freedom, culture and resistance in the post-colonial literature of the region. Finally, Dahdouh-Guebas and Koedam (2008) also suggest that researchers should take a hard look at the archives. Once in those depositories, scientists must scrutinize old maps and drawings as well as the undecipherable explanations, legends and scribbles inscribed in the maps. The authors go as far as to suggest that “despite the valuable information contained in such historic archives, there is no evidence of their utilisation to study any aspect of the essential tropical coastal ecosystems” (2008:84), at least for the colonial world dominated by the Dutch. The status of the use of archival data may be different for the English and Spanish domains. However, their point is well taken and should be underscored – researchers must invest more time in the archives, or incorporate historians, anthropologists and archeologists into the understanding of the mangrove ecosystem. To this, I add in a true transdisciplinary way, that is, that each researcher efface the contours and boundaries of their own disciplines, while engaging in the gaze and even the epistemologies of other fields, as if they were in their own. Dahdouh-Guebas and Koedam (2008) use the example of a map from a coastal island in Senegal drawn in 1816 by the British. The authors draw the attention to the comments written in the map with information on the distances, tides, winds and directions, which was the standard information provided in a text form in the British maps. This information was “relevant for biological interpretation on mangrove ecosystem dynamics” (2008:85). There is a wealth of cartographic information for Puerto Rico and the rest of the Caribbean that remains unexplored, in terms of the “transdisciplinary” opportunities it may contain. A clear example is the amount of data provided by the map below of the mangroves in the Guayama-Salinas coast (south shore), drawn by the Spanish military in 1884, and is accompanied by a textual description of the areas (not provided here). Documents and history await. The United Nations Development Programme (UNDP) recently declared Latin America and the Caribbean as a Biodiversity Super Power, stated in their recently published report on the economic contribution of biodiversity and ecosystem services of the region (Bovarnick, A., F. Alpizar, C. Schnell, Editors. The Importance of Biodiversity and Ecosystems in Economic Growth and Equity in Latin America and the Caribbean: An economic valuation of ecosystem, United Nations Development Programme, 2010). Interested in more information? Please click here to access UNDP’s webpage with the detailed report.